The greenhouse module can be used in all types of greenhouse, from small tunnels to large multispan. The module structure are very sophisticated in order to be adaptive in every installation type. The main object at the greenhouse module is the facility. The facility represents a virtual place that contains the equipment of the greenhouse and the planting area. Each facility support a large number of equipment like the pumps, filters, irrigation manifolds, windows control, ventilation control and water quality monitoring. The facility support up to 80 tunnels or spans objects and can handle different plants crops in the same facility. Each tunnel \ span has it's own equipment of filters, up to 10 irrigation manifolds with support of up to 40 programms per valve, up to 10 air and ground sensors, crop manager and the hydroponic drain monitor system. For example, a company may have 6 tunnel greenhouse with soil and 1 multi-span with 10 spans greenhouse with hydroponics. The total number of used tunnels \ spans is 16 of the 80. For bigger installations, the module supports up to ten facilities. 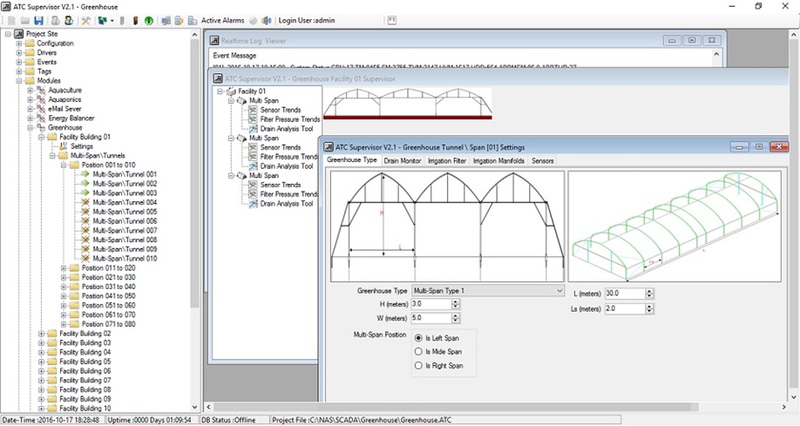 With Greenhouse Tunnel \ Span editor, you can easily design your greenhouse with various types of tunnel or multi-span greenhouse. 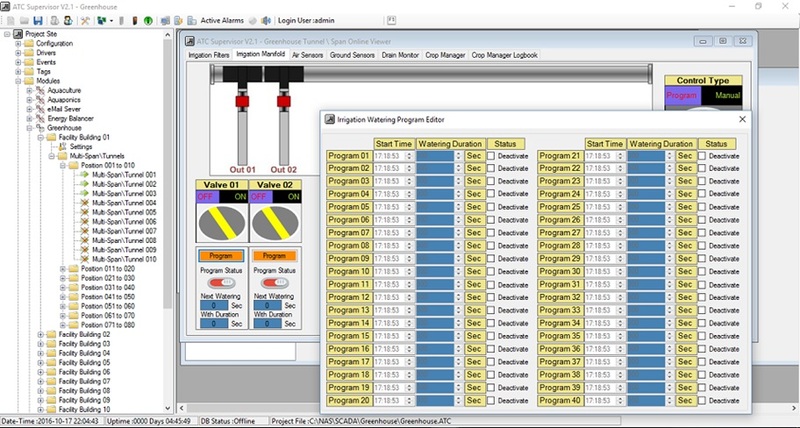 When the system switched to runtime mode the operator can use the facility viewer. 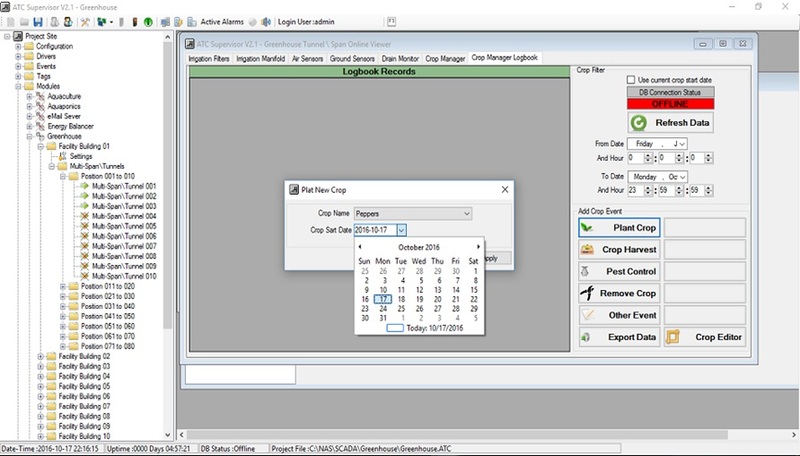 The facility tree explorer at left side helps the operator to easily navigate on trends and data tools. The right side contains the greenhouse(s) tunnels or spans overview. 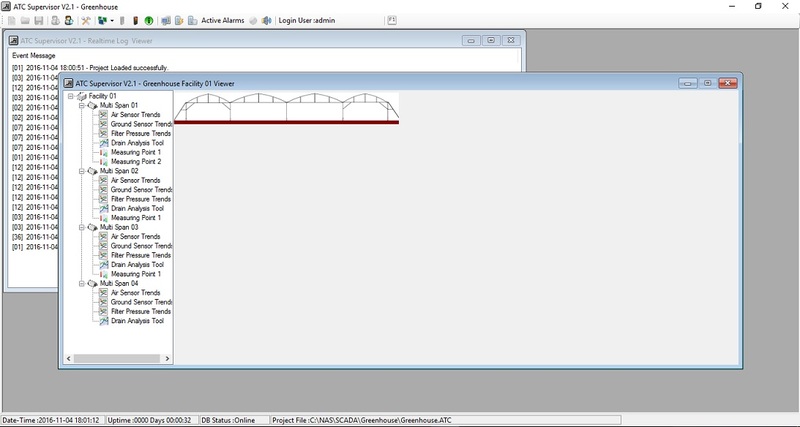 The operator can click on each tunnel \ span to open the tunnel \ span viewer. Each Tunnel \ Span may have an irrigation filter. 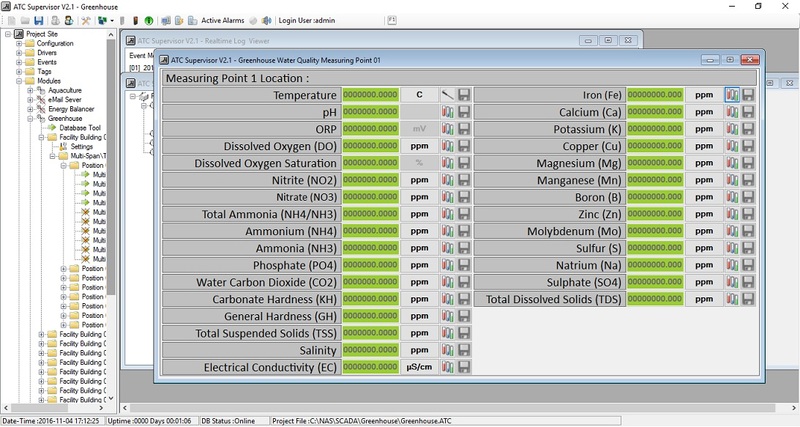 With Filter Editor you can easily design and operate your greenhouse irrigation filters with various filter types. Each Tunnel \ Span can have up to 10 valve controlled manifolds for the irrigation system. 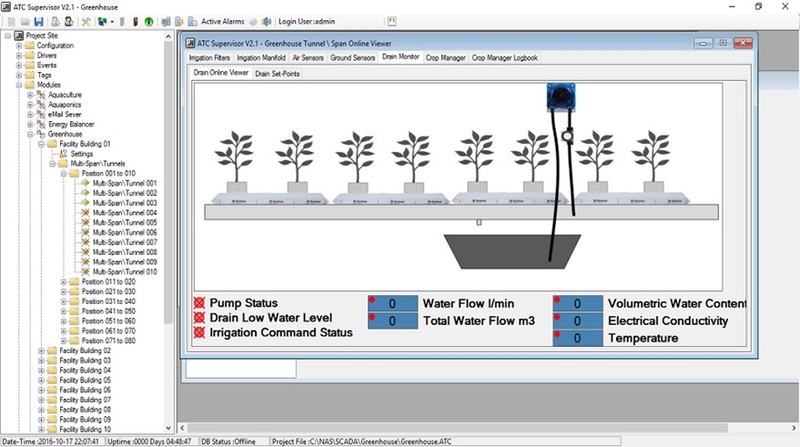 You can easily design and operate your greenhouse irrigation manifolds with the usage of up 40 time programs per valve. Each Tunnel \ Span can divided to 10 sectors. Select the sectors that are important at your Tunnel \ Span and install the air sensors and then you will be able to monitor air temperature, humidity, CO2 and solar radiation. Each Tunnel \ Span can divided to 10 sectors. 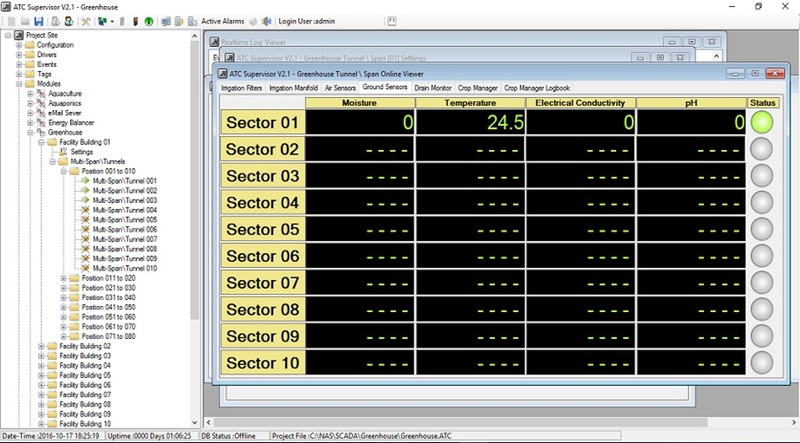 Select the sectors that are important at your Tunnel \ Span and install the ground sensors and then you will be able to monitor the soil or hydroponic substrate volumetric water content, temperature, electrical conductivity and pH. On each Greenhouse Tunnel \ Span you can install one hydroponic drain system. 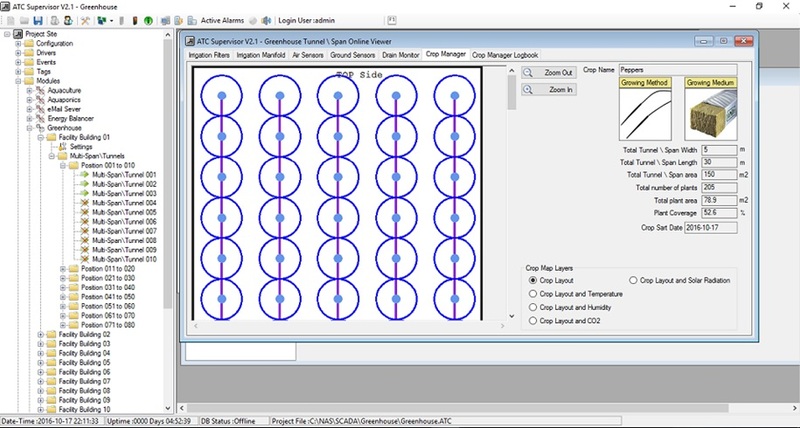 This tool give you the ability to operate hydroponics greenhouse more efficiently. Each Greenhouse Tunnel \ Span have the crop Manager Logbook. Crop operations like planting, harvest, pest control, remove crop etc are performed with few clicks. 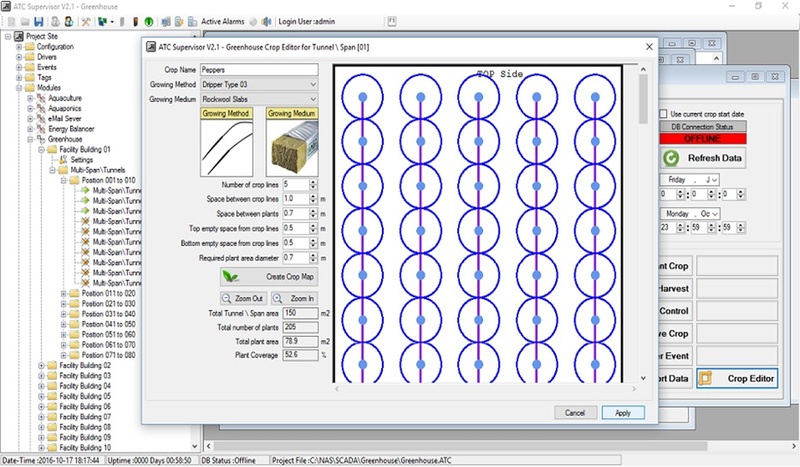 With the Crop Editor tool you can easily design your greenhouse crop layout. Just enter some parameter like space between crop lines, space between plants and etc. After the definition of your crops, you can plant a new crop. The new plant crop is displayed to the Crop Manager. Each tunnel \ span can have up to two water quality measuring points. 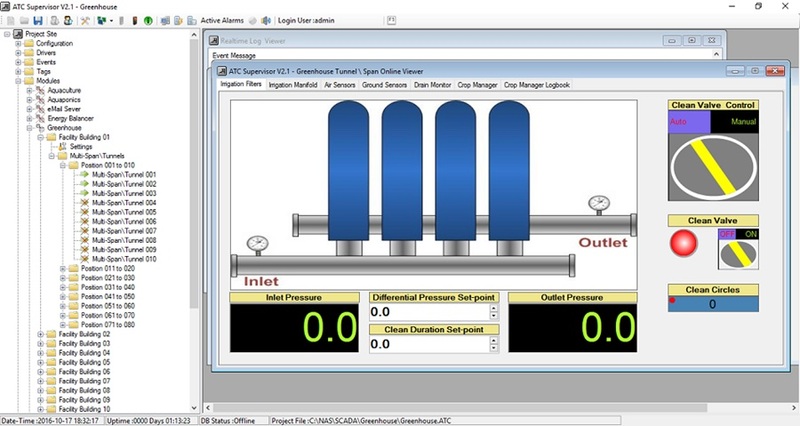 Each measurement can be measured from probe or can be entered manually from the operator.